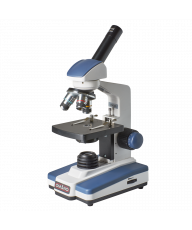 Save 15% on NEW LED versionTypically, most zoom stereo microscopes provide 7x-45x magnification. Since the OMV provides 7x-35x, it is significantly more affordable in spite of the minimal reduction in magnification at the upper end of the range. 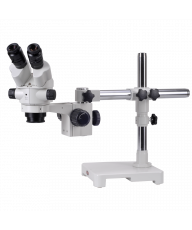 In other words, the OMV represents excellent value with 3W variable LED illumination, rack and pinion focusing and dual diopters - features typically associated with microscopes of significantly higher price. 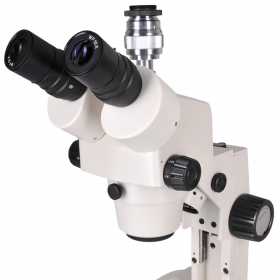 The OMV is a fixed arm stereo microscope with rugged construction that has proven particularly popular with Mud Loggers. 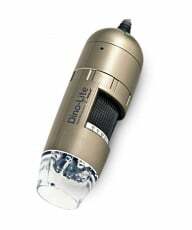 An added benefit is an included 23mm trinocular adapter with the OMV-T trinocular version.OpticsThe OMV includes two WF10x eyepieces and zoom magnification from 7x-35x. There are dual diopters for individual eye focusing and interpupillary adjustment in the range of 55-75mm. 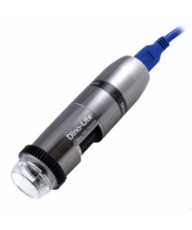 The OMV-T trinocular includes a 23.2mm smooth camera tube. Focus & illuminationRack & pinion focusing includes left and right hand controls and the 3W LED illumination offers a service life of 50,000 hours for years of economical and dependable operation.AccessoriesBlack/White contrast plate, frosted glass stage plate, eyecups, dust cover, manual.Customer Quotes "UPS just delivered my new Stereo Scope and I would like to express my appreciation and satisfaction in your product and service. I was totally overwhelmed by the speed in which it arrived....less then 24 hours. WOW!!!!. As for the OMV, it was EXACTLY what I was looking for and could not be happier. Thank you again for your help and making my day. You have earned my highest recommendation." --Sincerely, Jim T. "I just wanted you to know I received my microscope today. I am very impressed with it. I can't believe you can sell these for this price. I have been a research scientist and engineer for many years. I have uses similar scopes costing thousands. This compares very well to those. Thank you very much for your excellent service, and fast shipping. 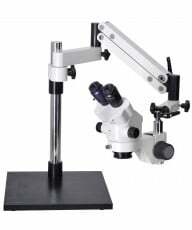 I researched these types of microscopes on the web a bit before buying. Yours is clearly better than many that I saw for twice as much, or sometimes even more. Please feel free to use my comments and name. I hope I can help in some way. Perhaps, we will do business again. I will certainly recommend you to my friends." Thanks again. Regards, Brian V.